For the Austin Veritas Defenders, a trip to the championship wasn't unfamiliar. The South Austin private school has appeared in three of the last four state finals, losing last year to Dallas Lutheran. The Lone Star North Tornadoes don't have that pedigree. The school, formerly known as Gainesville State School, is one of two boys’ detention centers in the state and it's the last stop for boys in the Texas Juvenile Justice Department (TJJD). Gainesville’s athletes, all of whom were convicted of a felony, are nearing the end of their court-ordered time. 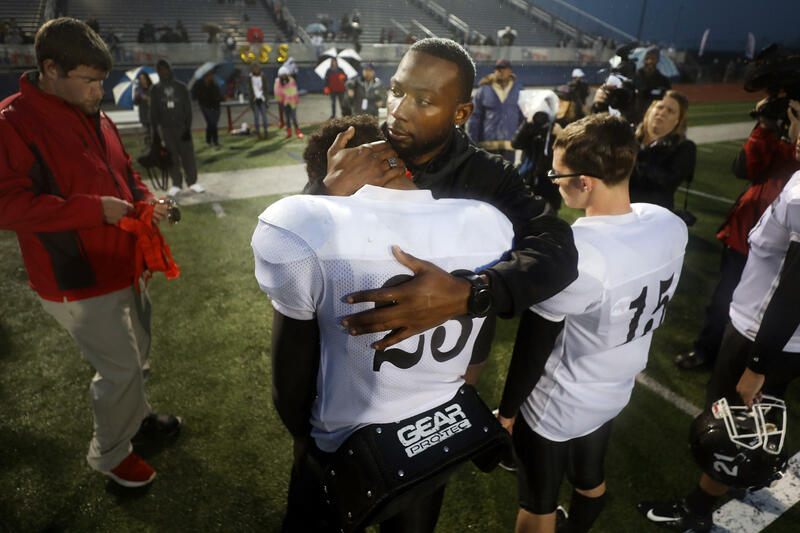 "The kids who get to play on this team are the ones who can show athletic skill and are the best kids that we have as far as behavior, trying hard and their spirit," said Camille Cain, executive director of TJJD. Lone Star North Gainesville goes through pregame routine before 2018 TAPPS D1 6-man State Championship. Gainesville players have earned their spot on the team as much through good behavior as they have through talent. But, because of the uncertainty of student release dates and eligibility issues, the school's roster instability limited it from fielding traditional 11-man teams. So, TJJD officials moved Gainesville to six-man for the 2018 season. For the uninitiated, six-man football started in Nebraska but really caught on in Texas decades ago. "It was a way for rural America to play football," said Granger Huntress, publisher of sixmanfootball.com. "It expanded everywhere because there was a lot of rural America back then and it’s kind of died off. There are only a few states that really play it now." But six-man is seeing a bit of a renaissance in Texas – mainly because it’s cheaper. It’s become more difficult to field and equip 11-man teams in smaller towns. And in cities, there has been growth in the number of small private schools. Many face problems getting enough kids to play. "Now, it’s crazy," said Huntress. "It’s essentially doubled for public schools and private schools. There are close to 100. 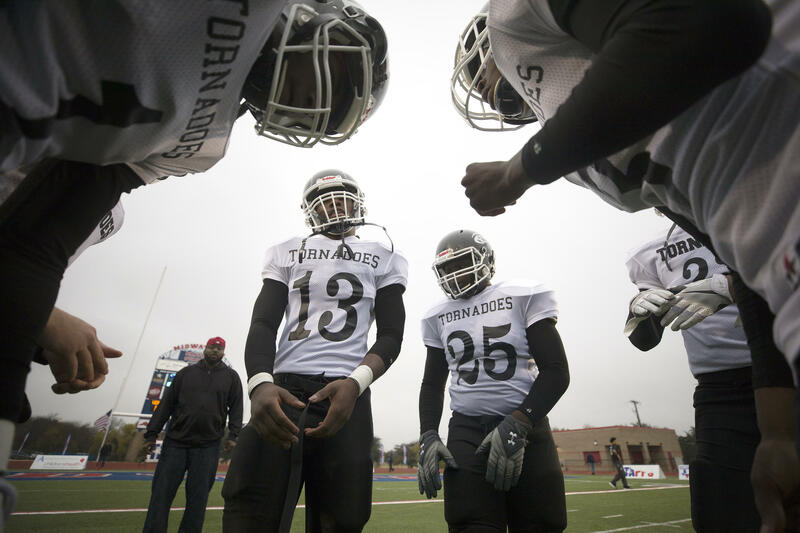 At any one time, there are close to 250 schools playing six-man football in the State of Texas." Coach Jonathan Hatfield with his team just before the 2018 TAPPS D1 6-man state title game. 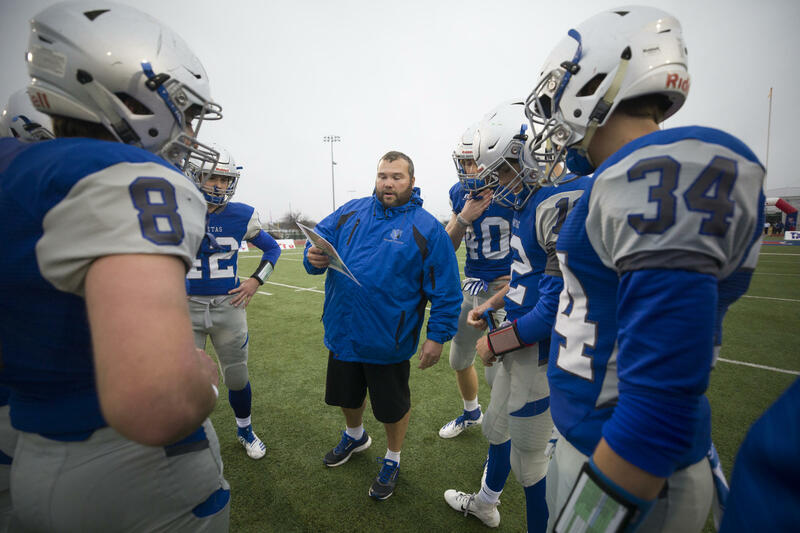 Riding that six-man private-school resurgence has been coach Jonathan Hatfield at Veritas. He started as an assistant at Veritas when they launched their program. He has been the head coach for the last four seasons, with four trips to state finals and three TAPPS titles. While that run is very impressive, Hatfield says he is more impressed and has the most respect the coaching staff at Gainesville and Giddings, the state's two schools for juvenile offenders. "I would have to guess that it’s hugely rewarding to see these kids that have struggled and gotten into so much trouble, and now as they’re getting out and fulfilling their commitment to their term, however long that is ­– that they get to come and experience this right before they get released," said Hatfield. There are other ways this game is different, like the Gainesville "cheerleaders." They are Gainesville staff members, corrections officers and case managers, who not only are urging them to succeed on the field, but also at school. They help the kids grow up, metaphorically and literally. "Some of them come in 5'5" and they leave 6-feet, you know," said caseworker Victoria Bradley. "We’re like second parents, and to some, older sisters. It’s definitely a joyful experience." Caseworker Regan Harris says it's a rewarding – and unpredictable – experience. Gainesville staff, corrections officers and caseworkers, cheer on the team. "[There's] something different every day you go there," said caseworker Regan Harris. "You never know what you’re going to encounter." Another difference this game is who is in the stands. 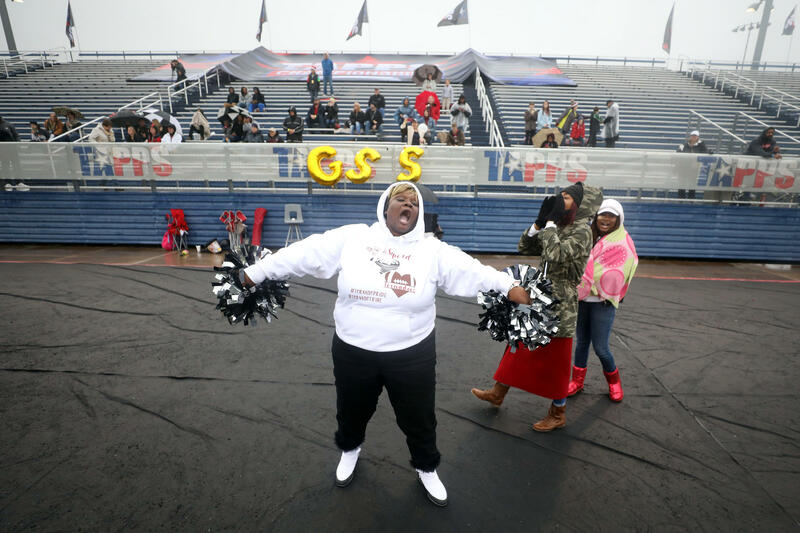 The football team from Lone Star Southeast, formerly known as Giddings State School, made the trip a week prior, when the two schools played each other in the state semifinal – the first time the two juvenile justice schools met in the playoffs. Giddings' coach Sandy Brown won three 11-man state titles in 38 years, but similar roster issues made fielding a full team difficult. Giddings moved to six-man in 2016 to keep the program thriving. "We all want to win, and I do, too," Brown said. "But the most important thing that we’re doing is mentoring kids. It’s what you’re teaching them about life that counts, not so much how many games you won that year." This is Gainesville’s first season in six-man football, with a young, second-year head coach, Roy Burns. With no 6-man experience, he has managed his team into the final. "I wanted to be at a place where I knew I was making a difference," said Burns. "And I feel like I’m making a difference here." Gainesville coach Roy Burns hangs state finalist medals on all of his players with a personal message. But, in the end, Gainesville came up short against Veritas. The Defenders beat the Tornadoes 60-38. In an unexpectedly moving runners-up ceremony, Burns delivered medals and quiet, personal messages to all 14 of his players. If everything goes as it should, most of them will not be back. They likely will not return for a homecoming. If they play football again, it likely will be at another school for another coach, and that’s exactly what Burns wants. "We work so hard because we want them to enjoy those things that we enjoyed as 16-, 17-, 18-year-old kids," said Burns. "Riding in a charter bus, eating at a nice restaurant, just seeing the state of Texas without having to worry about how you’re going to get there or when I’m going to do it. So, this is the perfect opportunity for them to grow, and be young men, and travel, and see the world and also learn a little about themselves." Lone Star North High Head Coach Roy Burns led his team to the state finals his first year in 6-man football. Cain says she's proud of the players for getting this far, and she's hopeful that they'll go farther as they transition out of the juvenile justice system. "The places that they’ve come are almost impossible to imagine, Cain said. "And the fact that they can come here today, and play this hard, and make it this far, shows the spirit and the heart they have and their ability to prevail and do great things in the future – if they can just count on themselves and learn to count on other people." After the game, the dozen or so Gainesville family members who could make the trip met for a brief, supervised visit in the parking lot. "It’s helping him get focused and mature and get ready for adult life," said Claudia Williams. Her son scored four touchdowns in the losing effort. He’s on track for release in the spring. His dad hopes there might be a junior college team in his future. 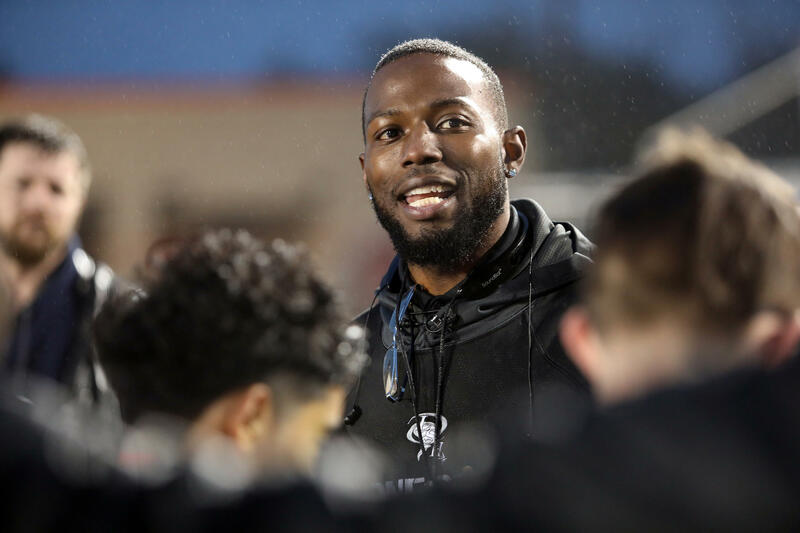 Then after the visit, both teams, Lone Stars North and Southeast – Gainesville and Giddings – got on a charter bus and ate at a nice restaurant – together. Refugio head football Coach Jason Herring spent all summer planning for this week, the Texas Class 2A State Championship game. He would have no idea how far he would have to veer from that plan to get to this point.